‘It’s late on a sunny morning and people have filled the park. 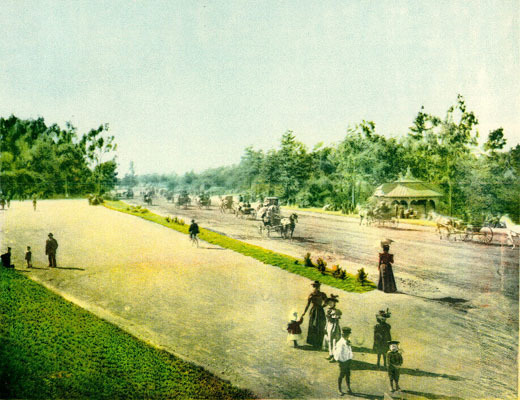 John F. Kennedy Drive is closed to car traffic, as it is every Sunday, and people are biking, skating, jogging, and walking. As I walk west to the de Young Museum, the sounds of music mix with the sounds of people. Lively music – ’40s style swing music – and as I get closer to the sound, I realize it’s coming from a gathering. At the corner of Hagiwara Tea Garden Drive and JFK, where taxis and tour buses turn toward the de Young and Academy of Sciences, more than a hundred men and women stand together around the source. But they don’t stand still. They’re dancing … or, at least, they’re trying to. Trish Richman is a regular. TRISH RICHMAN: I first came to Lindy in the Park, probably almost six years ago. She’s got dancing in her blood. RICHMAN: My father was a swing dancer back in the ’40s, and we used to dance in the house, after dinner, and I’ve never thought about it, but all this music is my music that I grew up with. A friend of mine mentioned that there was a group of people dancing in the park, and he walked me by here and that was it. I’ve never stopped. Richman and I are standing with others in a circle, surrounding all kinds of dancers. All kinds of people. Casual park-goers in shorts and tee-shirts, serious dancers in sporty clothes. One guy has tattoos and piercings all over his body – and he’s very, very good. All the old ladies want to dance with him. . . .
Back home in Chile I love to dance, but in night clubs, or at friends’ houses, and probably with a drink in my hand. These people are in a park, in public, in the sunshine. But I decide to give it a try . . . I feel ridiculous. And I want to get back in the circle of people watching. But then I look at the other students, all trying, some of them failing, all having fun, and I realize: “This is good.”. . .
RICHMAN: I think that with this dance, maybe with all dances but with partner dancings, there really are connection with another person. So if you work on a computer all day long and you don’t connect, this is how ever long the song is, a minute and a half, you’re connected with your partner. 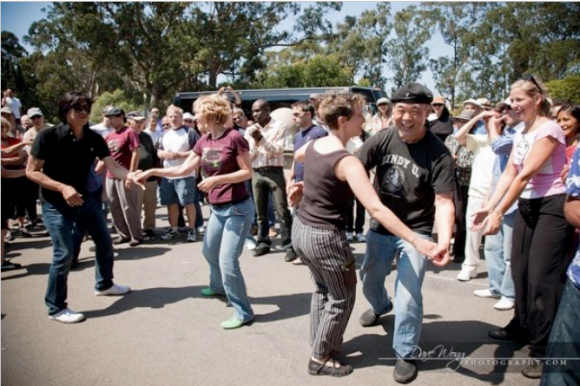 via Taking the dance floor outdoors in Golden Gate Park | San Francisco Bay Area News – Crosscurrents from KALW. This entry was posted in events in Golden Gate Park, people, recreation and tagged dancing in the park, golden gate park, lindy in the park, walk in the park. Bookmark the permalink. This looks like great fun! I want to go when we visit San Francisco. It’s wonderful. It happened to me once… I was just wandering through, heard interesting music, and followed it come upon all these people dancing! It was so random and so serendipitous at the same time.